In South Korea, Moon Jae-in, who wants a softer approach to North Korea, has won the country's presidential election. Moon told supporters, "I will be president for all South Koreans." He declared victory after the two other major candidates conceded defeat. The East Asian nation has been sharply divided as former president Park Geun-hye faces a trial on corruption charges. Moon won about 41 percent of the vote. Hong Joon-pyo came in second with 23 percent, and Ahn Cheol-soo received 21 percent. In the South Korean election system, the candidate getting the most votes wins the presidency even if it is not a majority. 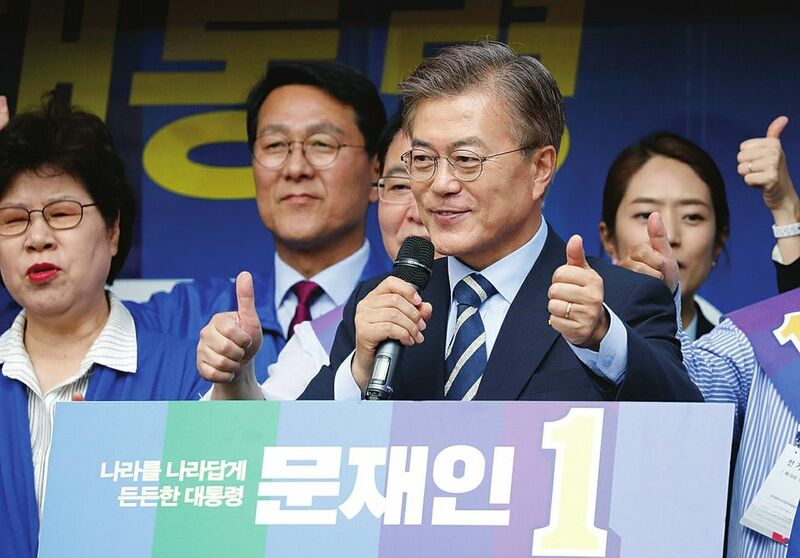 Moon will be sworn-in on Wednesday as soon as the vote count becomes official. The U.S. State Department in Washington said it is looking forward to continuing 'close, constructive, deep cooperation' with South Korea's new leader. Moon Jae-in is a former human rights lawyer. His parents fled North Korea during the Korean War. Moon lost in a close vote to Park in the 2012 presidential election. As a member of the National Assembly, he led the main opposition party during the presidency of Park Geun-hye. Moon gained popularity among supporters by proposing policies such as increasing government spending for jobs and education. However, conservative voters question his policies on North Korea and criticize him as being weak on national security. Moon has called for a two-track policy toward the North. He said he wants to support talks while at the same time continuing pressure on the North Korean government to change. Observers say his proposal is similar to the Sunshine Policy of Engagement started in the early 2000s by then-President Kim Dae-jung. Attempts to build trust between the two Koreas ended with North Korea's nuclear and missile tests early last year. South Korea answered with sanctions on the North and by closing the Kaesong industrial complex, the biggest economic link between the two sides. South Korea also has increased military exercises with the United States in an effort to pressure the North to stop its weapons program. During the presidential campaign, Moon criticized that policy, saying it resulted in faster nuclear and missile development by the North. On Tuesday, Moon said the next South Korean president should work with the U.S. and China diplomatically. The goal would be to return North Korea to negotiations to solve the nuclear issue, he said. Also, Moon will have to deal with the deployment of the U.S. THAAD missile defense system. U.S. President Donald Trump has said South Korea should pay some of the cost of the system worth more than $1 billion. South Korea has said it already has met the conditions of the agreement. The presidential election was held months earlier than planned this year because former president Park Geun-hye was removed from office. Park has been caught up in a corruption scandal involving a long-time friend and millions of dollars in money from large Korean corporations. After the news was first reported, hundreds of thousands of South Koreans took part in protests last fall, calling on her to resign. Park's removal from office hurt the country's main conservative political party. The party split into two groups: one opposed to Park and the other that supports her. Park is the daughter of former South Korean President Park Chung-hee. Many older voters continue to support the national defense policies of the conservative parties. One such voter, Lee bong-ho said this. "I've been supporting conservatives because I consider stability. Looking back at previous administrations, conservatives secured stability." Various countries should carry out dialogues and inform each other of respective security and defense policies and major moves. The government is involved in yet another corruption scandal. Office material worth hundreds of thousands of pounds was smashed up. 1.The party split into two groups: one opposed to Park and the other that supports her. The party split into petty factions. The party split into two distinct groups. 2.Looking back at previous administrations, conservatives secured stability." Looking back, she feels she should never have hung up her backpack. Looking back helps insofar as it helps you learn from your mistakes.